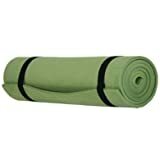 This is a great compact and lightweight sleeping mat and is ideal for camping. Protects against the cold rough ground when camping. Sleeping mats make a great difference to your comfort when camping. Provides a barrier between your sleeping bag and the ground. Sleep mats help keep you warm and dry. Easily strapped to your rucksack.